No one man so influenced the English translations we read today as William Tyndale -- often referred to as "The Father of the English Bible." Tyndale was born in England in the late 1400's. He was a very bright child, and at an early age he went to Oxford University, where he received his Master of Arts degree when he was in his early 20's. He lectured at Oxford for about a year, then went to Cambridge University, where he learned Greek. It was there that Tyndale came in contact with several Protestant sympathizers. Early in his life, William Tyndale became convinced that much of the confusion about the Bible was caused by lack of knowledge of its contents. He discovered that many priests were incapable of reading and understanding the Latin Vulgate, and thus were as ignorant of the Scriptures as were their parishioners. He felt the solution was a translation of the Bible in English. There were already partial translations of the Bible in Italian, French, Spanish, German and Dutch. Yet the Catholic Church's hold on England made it difficult to create and distribute even a partial English Bible. In spite of this, Tyndale became committed to giving England a Bible in her own language. In a public debate with a clergyman, Tyndale said that if God would spare his life, he would see that a plowboy would know more Scripture than the priests of the time. This did not endear Tyndale to the established church, but it did show his fearlessness in defending the need for a Bible in the language of the people. Tyndale was not going to be denied his translation. There were laws at the time forbidding Bible translations in England. 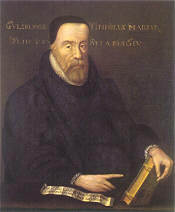 While at Cambridge, Tyndale had become friends with others who were unhappy with the Catholic Church. Through them, Tyndale met a wealthy cloth merchant with Protestant sympathies who let him stay at his house. It was there that Tyndale secretly began his translation of the New Testament in English. Instead of translating from the Latin Vulgate — the accepted Bible of the Catholic Church — Tyndale translated from the original Greek; he felt that this would result in an English translation that was much closer to the original meaning. However, it didn't take long for him to realize that England was just not the place to do this work. Both the Crown and the Pope had spies; it would simply be a matter of time before one of them would find out about Tyndale's project. So Tyndale packed up and moved to Hamburg, Germany. It was there that he completed his first translation of the New Testament. In August, 1525 he went to Cologne to find someone to print his English Bible. Shortly after printing began, the German authorities found out about the translation and they forbade its printing. Not to be denied, Tyndale left for Worms (another city in Germany), taking with him the 6,000 copies of the first 22 chapters of Matthew that had already been printed. It was at Worms that the printing of Tyndale's New Testament was completed, and copies began to reach England by 1526. Since it was still against the law in England to make an English Bible translation, Tyndale's New Testament had to be smuggled into the country. It came in bales of cloth; it came in barrels of flour; it came as individual pages that were hidden in the pages of larger books; it came in just about any way that would get past English authorities. Bishop Tunstall was not alone in his opinion: Thomas Moore, a leading scholar of the time, called Tyndale "a devilish, drunken soul." Of Tyndale's New Testament, he said it "was not worthy to be called Christ's Testament, but either Tyndale's own Testament, or the Testament of his master -- the Antichrist!" (No love here — you can see why Tyndale had to move to Germany.) Part of Moore's problems was that Tyndale did not translate certain words in the way that was favored by the Catholic Church. He used the word 'congregation' instead of 'church'. He used the word 'senior' instead of 'priest'. He used the word 'repentance' instead of 'penance'. Tyndale's highly anti-Catholic marginal notes didn't help either. However, many educated people in England were anxious to read Tyndale's new translation. The Church was just as anxious to see that this did not happen. When Bishop Tunstall finally realized that he was not going to be able to find Tyndale Bibles as fast as they were being smuggled into England, he came up with another plan. If he couldn't seize them all, he'd buy them all. Through his agents, the Bishop tried to buy up every copy of Tyndale's Bible that could be found — both in England and on the mainland of Europe. Then he would have a massive book burning to rid England of Tyndale's work. Tyndale, on the other hand, was not displeased when he heard of the Bishop's plan. Even though they were destined for the bonfire, Tyndale knew his first edition of English Bibles would be a sellout — the Bishop would see to that. This would assure him of plenty of money to create a revised second edition; in fact, he was hoping that the burnings would advertise the fact that his Bible was available. So one of William Tyndale's fiercest enemies — Bishop Tunstall — became his best customer of English Bibles. God does indeed work in mysterious ways. So successful was Bishop Tunstall in his effort to wipe out the English Bible, that today only two copies of Tyndale's original New Testament exist. Yet the effort was futile. Just 8 years later in 1534, the second edition of Tyndale's New Testament was released. He had carefully gone over his first edition and made modifications and corrections. He removed some of the more controversial marginal notes, and added introductions to each book of the New Testament. There were even a few Old Testament readings in the back of the book. It was indeed Tyndale's crowning achievement to that point. Tyndale never did get to complete his translation of the entire Bible. Following the release of his second New Testament, Tyndale started to work on the Old Testament, using the Hebrew Text as his basis. He had learned Hebrew specifically so he could create an Old Testament translation. Tyndale had completed all the books through Chronicles when his work came to an abrupt end. William Tyndale had done almost all the work on his Old Testament translation in Antwerp, a city in what is now Belgium. Because of his English Bible, Tyndale was considered a criminal in England. In fact, in 1530 Henry VIII issued a proclamation "for the damning of erroneous books and heresies and prohibiting the having of Holy Scriptures translated into vulgar tongues" -- like English. However, as long as Tyndale remained in the free city of Antwerp, he was safe. Or so he thought. Holy Roman Emperor, Charles V (Charles I of Spain) felt that Tyndale was the worst of heretics, and in May, 1535 had him kidnapped, taken from Antwerp, and imprisoned near Brussels. The next year he was tried and (to the surprise of no one) found guilty of heresy and sentenced to be executed. When the time came for his martyrdom, Tyndale was tied to a stake, strangled by a hangman, then burned. His last words were "Lord, open the King of England's eyes." A tragic yet heroic end to what was perhaps the most-gifted and dedicated Bible translator ever to pick up a pen. William Tyndale's translating abilities were outstanding. Many other English Bible versions were to come on the scene following his death. But none of these versions ever matched the quality of Tyndale's Bible -- except those that included Tyndale's work verbatum. 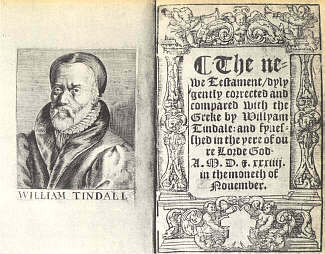 It has been said that 90% of Tyndale's work ended up in the King James Version, which was published some 75 years later. His decision to use original Hebrew and Greek texts, not the Latin Vulgate or some other translation, made for a Bible that was highly accurate. And his skillful translating ability made a Bible that was easily readable. It is with great respect for his devotion and committment that William Tyndale is called "The Father of the English Bible." Use the Menu on the left to view actual pages from Tyndale's Translation.